The endgame for ride-hailing apps like Uber and Lyft seems to be to eventually eliminate pesky, expensive and unionization-prone human beings from the equation. To do that they need self-driving cabs, and automakers want in on that game too, so they’re partnering up to get access to the apps’ existing extensive user networks. 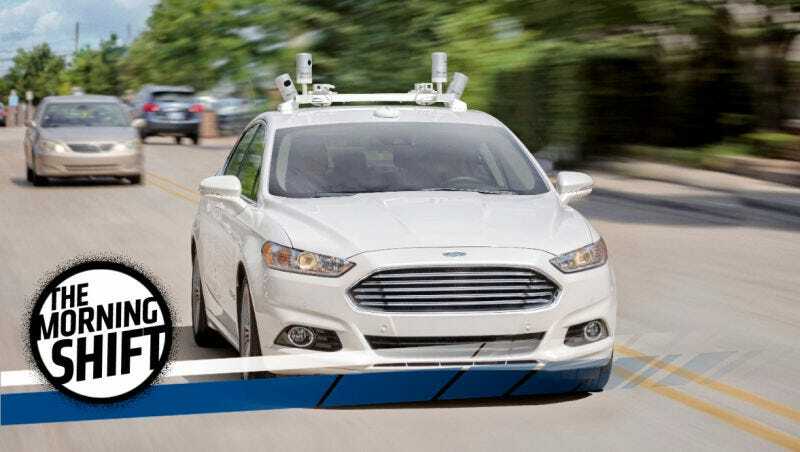 Ford self-driving test vehicles will be connected to Lyft’s network, but at first, customers will not be able to use them, said Sherif Marakby, Ford’s vice president for autonomous vehicles and electrification. Ford will put human-driven vehicles on Lyft’s network. Marakby did not say when Ford and Lyft expect to offer the first rides in self-driving cars. “We’re not building prototypes for the sake of building prototypes,” he said, adding Ford intends to ultimately put thousands of self-driving vehicles in use. Ford’s new CEO Jim Hackett is scheduled to meet with investors on Tuesday to outline the automaker’s strategy for boosting profitability. In some ways, this feels like kind of a Silicon Valley do-over for Ford. Recall that one big reason former Ford CEO Mark Fields got the axe was a botched deal between the automaker and Google to develop autonomous cars. That partnership was doomed by culture clashes and differences of opinion on how big and public it should have been, but it seems like Ford is finally getting the deal it sought with Lyft now. Everyone’s in a race to get self-driving cars on the road first, from General Motors to Tesla to BMW to the tech companies. Meanwhile in Saudi Arabia, the mandate that finally allows women to drive cars is an incredibly positive social development—and one that the corporations will be quick to capitalize on. Now, automakers will be able to sell cars aimed at women and their families, reports Bloomberg. [...] Initially, the liberalization move may create road safety issues as new, inexperienced drivers navigate Saudi Arabia’s streets, Lindland said. This could blunt the negative impact on ride-sharing services like Uber, at least at first. Uber also could benefit from a new pool of female drivers for its car-hire service. The government also has a vested interest in seeing the company succeed — Saudi Arabia’s sovereign wealth fund is a major investor. Barring any major changes to NAFTA, Mexico is increasingly the next big forefront for global auto production—Toyota, BMW, Ford and more have growing footprints there. Auto worker Ivan Flores spends his days transporting parts for U.S.-bound Audi SUVs at a plant in central Mexico, but he laughs when asked if he could ever buy one of the $40,000 Q5 SUVs the plant produces on his $2.25 per hour salary. “For us it is a dream to buy a Q5; we never could,” said Flores, 40, who supports three sons on his roughly $110 weekly paycheck. But in Mexico — where the auto industry has boomed under the North American Free Trade Agreement, with plants like the Audi factory that opened in Puebla state in 2016 — the industry has created something different: a class of workers who are barely getting by, crammed into tiny 500-square-foot apartments in government-subsidized projects that they pay for over decades. Many can’t afford even a used car, taking home as little as $50 per week after deductions for mortgages and cafeteria meals. That story is worth a read in full. Remember where your car comes from; it’s not always a nice place. EU regulators fined Scania 880 million euros ($1 billion) on Wednesday for taking part in a truckmakers cartel which has already cost four of its peers a combined 2.9 billion euro penalty. The European Commission said Scania, owned by German carmaker Volkswagen (VOWG_p.DE), colluded for 14 years with the other cartel members on truck pricing and on passing on the costs of new technologies to meet stricter emission rules. In July, Volkswagen’s MAN, Daimler (DAIGn.DE), Volvo (VOLVb.ST), Iveco (CNHI.MI) and DAF (PCAR.O) admitted to taking part in the cartel in return for a 10 percent cut in their fines. Scania did not settle. Reverse: What Did You Call My Mother? Neutral: Does It Matter Where Your Car Got Built? Does the ethics of car manufacturing enter into your decision at all?